Whoever said fruit couldn't make a person rich must have never played a slot machine in their life. Click here to play! Cherries are the best sorts of fruit, but those evasive little fellows need to be picked before they will pay out. Crazy Cherry presents you with the task of teaching those flagrantly cocky fruits a thing or two about winning big on the slots! This 3-reel, 1 pay-line game is extremely simple to play, and offers extra opportunities to win with a Wild symbol. The Crazy Cherry symbol will allow you to complete any winning 3-symbol combination, and will pay out ridiculously well. Additionally, the game allows you to play anywhere from 1 to 5 coins each spin, so the more coins you play, the more money you receive when you win! For example, if you manage to get 3 Crazy Cherry symbols on your pay-line when playing with 5 coins you will be paid out 5,000 times your initial wager! 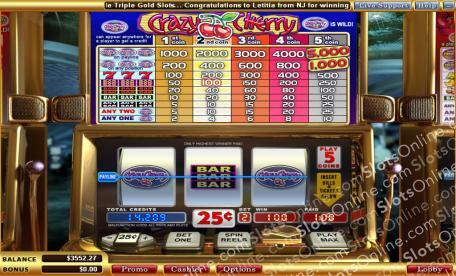 So if you are keen on winning some cash today, head on down to the Crazy Cherry slot machine for a sweet surprise. The Crazy Cherry symbol is Wild in this slots game. It can be used to complete any winning combination of 3 symbols. For example, if you had two 7s and a Wild, you would be paid out as having three 7s.